At the Wolinetz & Horvath law firm in Columbus, Ohio, we offer a comprehensive range of family law services aimed at helping us protect our clients' rights and best interests during all types of sensitive and serious domestic relations challenges. With more than 75 years of combined legal experience, our team of legal professionals possesses the knowledge and insight to help you resolve your disputes and achieve the most favorable outcome possible. We understand that no two cases are exactly alike, which is why we tailor our approach to help you meet your specific needs and goals. When you work with our law firm, you can expect to receive dedicated attention from a trustworthy attorney totally committed to your case. Whether inside or outside the courtroom, we will aggressively advocate on your behalf, to help make sure you obtain the results you expect while treating you with the respect and dignity you deserve. 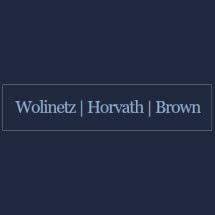 If you are facing divorce or have some other family law issue you need to address, you can contact Wolinetz and Horvath to schedule an initial consultation with one of our attorneys.